The deal’s opponents in DC are not letting up. This week, Congress, fresh off its August recess, debated a resolution expressing disapproval of the Joint Comprehensive Plan of Action (JCPOA) with regard to Iran’s nuclear program. And while the resolution is unlikely to make it past Friday’s cloture vote in the Senate, the deal’s opponents are by no means about to wave the white flag of surrender. Not yet anyway. On Tuesday morning, at the American Enterprise Institute, DC’s temple of neoconservatism, the 46th vice president of the United States, Richard Bruce Cheney, laid out his rather, well, less-than-compelling case against the Iran deal. Speaking before an adoring audience of neocon apparatchiks, Cheney’s speech was largely overshadowed by the the contemptible temper tantrum thrown by the pro-Israel Washington Institute for Near East Policy’s Patrick Clawson. That same evening an overflow crowd of beltway insiders gathered at the Brookings Institution to see Iran deal opponents John McCain and Leon Wieseltier debate Brooking scholars Bruce Reidel and Suzanne Mahoney on the merits of the deal. McCain was in typical ill-humor, while Wieseltier rattled off a series of Yoda-like epigrams to the increasingly puzzled audience. If one liners like “a respite from a problem is not a release from a problem”; “the deal is a change in degree, not a change in kind”; “we get a Band-Aid, they get a banquet”; and “we all sit wherever we sit” were designed to win over the wonkish crowd, then they signally failed to do so. McCain and Wieseltier went down in defeat, with the crowd voting overwhelmingly to support the deal. The next day, Wednesday, Brookings played host yet again, this time to former secretary of state Hillary Clinton, who delivered a speech which was the definition of “Clintonesque.” Her knack for triangulating was on full display, with Clinton announcing her support for the deal while also rattling off a series of hawkish talking points designed to show that she too loves Israel very, very much. Her speech was obviously not intended to win over the Democratic Party’s progressive primary base but rather was intended to reassure the donor class that she has zero intention of ever calling Israel to account for any of its own egregious, destabilizing behavior. And Israel was much on the minds of the speakers and attendees of Wednesday afternoon’s anti-Iran deal rally on Capitol Hill. Sponsored by the Tea Party Patriots organization, the rally seemed to attract fringe right-wing elements, rabid pro-Zionists, and your average Obama-hater, though, thankfully, not too many of them. This man’s take was positively measured compared with what was emanating from the podium. Mort Klein of the Zionist Organization of America called Iran’s Ayatollah Ali Khamenei “the Hitler of today” and declared that “Obama is sympathetic to radical Islam” to huge applause. Klein was followed by the indefatigable conspiracy theorist Frank Gaffney of the Center for Security Policy who bellowed “If Republican leaders in the Senate and House do not stop the deal…their names will be on the bombs.” Presumably he was referring to Iranian bombs, not, you know, American bombs which are deployed on a near daily basis across the Middle East. Then came the main events: Ted Cruz and Donald Trump. Cruz was in fine fettle, as these are his people. Among the assembled, Cruz signs and supporters where every bit as numerous as Trump’s. 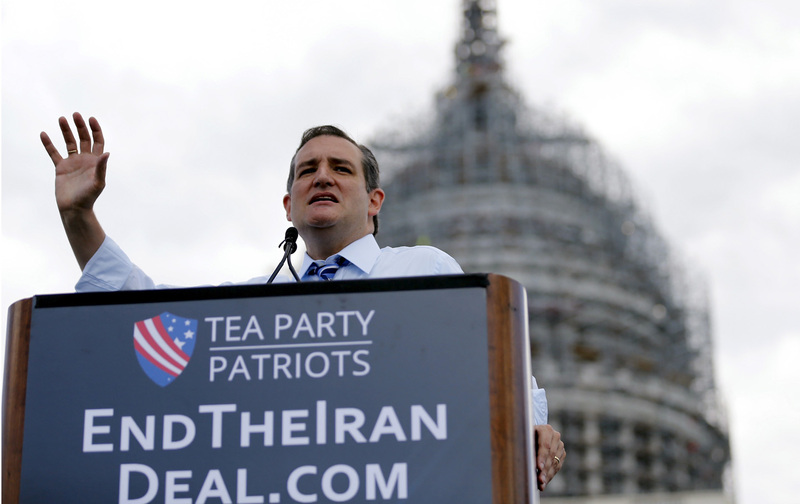 And Cruz didn’t disappoint, tossing out one chestnut after another, telling the crowd that if the deal goes through “the Obama administration will literally become the world’s leading financier of radical Islamic terrorism.” According to Cruz, the deal could enable Iran “to kill tens of millions of Americans” if—and no doubt when—it unleashes a nuclear weapon over the East Coast. “Americans will die, Israelis will die, Europeans will die,” declared the junior senator from Texas. As of this writing, the Senate is due to vote on a cloture motion which would effectively kill the anti-deal resolution. It is heartening to think that the Reppenhagens of the world are about to carry the day, and in the face of much vicious and reckless nonsense from the deal’s opponents.